Innistrad faces destruction. Emrakul has risen, and the Eldrazi titan has brought with her a plague of horrors and mutations that threatens to overwhelm all other life. 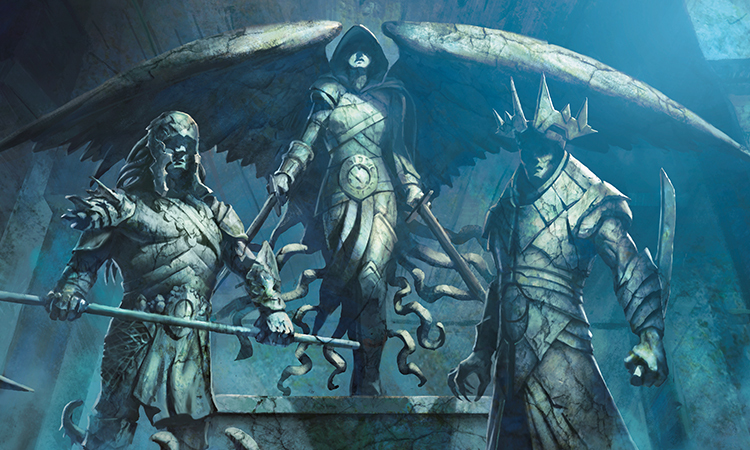 The Gatewatch has assembled at Thraben, and the recent arrival of Liliana and her zombie hordes have bought them time and room to formulate a plan. But will any plan be enough to conquer Emrakul? It was a pleasure to watch the so-called Gatewatch contort and agonize. 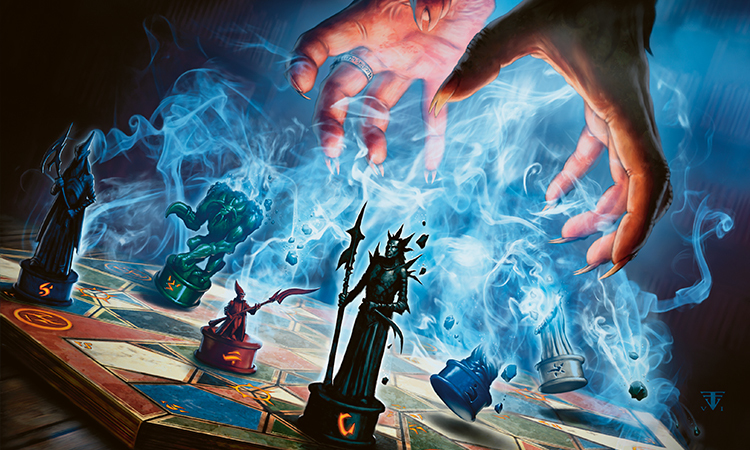 Gideon's poorly restrained frustration; Nissa's discomfort; Chandra's impatience; Jace's pained indecision. Jace was in his favorite place—caught in the middle due to arbitrary restrictions he had made up, and wondering why life's decisions were always so difficult. You're never going to change, are you? Liliana couldn't tell whether it amused or disgusted her. Both, sometimes. A moonfolk flew into the clearing, her eyes wide and breath short. She took no notice of the large ring of zombies protecting them from Emrakul's minions, though she did look up at the grand spectacle of Emrakul; it was impossible not to. She landed next to Jace, speaking rapidly though too quietly for Liliana to hear. She stopped talking in a way Liliana would have found confusing if she hadn't already spent a great deal of time with a telepath. She must be the moonfolk Jace had mentioned. Jace and Tamiyo continued their silent conversation, moving closer to one another as they touched minds. Liliana frowned. Another useless mind mage, just what we needed. She wanted some time alone with Jace, to figure out what the endgame here was. Her zombies had brought a temporary respite. But they needed to get out of here, away from Thraben, away from Innistrad, away from Emrakul. As she thought of the name, Liliana's eyes were drawn upward to the towering figure hovering outside of Thraben. Why is it just sitting there? The air felt heavy, stale. Fecund with the smell of...it wasn't the dead. Liliana was comfortable with the dead and their smell. But there was a rotten quality to this smell Liliana found troubling. There was a sudden shifting in the air, the smell and pressure of a spring day before a thunderstorm, and in that shifting Emrakul unfolded. Its cloud burgeoned; its long spindly tendrils lengthened and multiplied, from hundreds to thousands, to tens of thousands, more. An invisible sphere of power burst from Emrakul, rippling and hitting each Planeswalker where they stood. Nausea roiled her stomach; vertigo twisted her mind. She had known that sickening combination of despair and sickness only a few times in her life. When her brother Josu's eyes had opened lifelessly, jet-black orbs portending doom; when she had first beheld Bolas's baleful gaze, hearing his spiteful laugh as he promised poisoned redemption; when the Chain Veil's power had first coursed through her veins, splitting her skin and cracking it open like a dry husk to let the blood, her blood, seep through. None of those moments compared to the wrongness she felt in Emrakul's presence. Liliana Vess had spent her whole life seeking not to die, and for the first time in her long existence she wondered if she had been pursuing the wrong goal. In the shadow of Emrakul's flowering, death seemed just another of life's superficial lies, a false hope poorly beating back the true horror awaiting all who existed. She shook her head with force, seeking to clear her mind. She had lived too long, overcome too much, to succumb now. We must flee this plane. This...it is insanity to stay. Not her thoughts, but the Raven Man speaking directly in her head, sounding...scared. Liliana took some pleasure in the fear. So you can feel fear. Her zombies moaned in unison, "Vessel of destruction. Root of evil. Flee." Liliana was startled. She was used to the Chain Veil talking nonsense about vessels and roots, but flee. Whatever Emrakul was, the Chain Veil wanted no part of it. The pressure in the air thickened, inducing a headache that watered her eyes with pain. The other Planeswalkers crumpled, all except Jace, who cast some type of spell in response. She bowed her head, her agonies multiplying. Emrakul outside. The Chain Veil inside. The damned Raven Man, wherever he was. She would not succumb. These are my zombies, my Chain Veil, my head. Mine! There was another explosion of energy from Emrakul, a full thunderstorm that made the earlier outburst seem a brief spring rain. Liliana was forced to her knees as she screamed in rage. Her zombies moaned a single word. A voice cut through the chaotic ramble, a familiar voice he was hearing for the first time. This is not going well. I will not succumb to this. I am better than this. Jace breathed evenly and slowly. Thought cohered. He tried to recall the gibberish dominating his mind just seconds ago, but it had already vanished, evanescent dew melting with the dawn. He was at the top of a long, grand spiraling staircase, white marble steps lined with ornate blue trim. The staircase was brightly lit though there was no obvious light source, and it extended down far beyond his sight. Above was a tall and airy stone tower. Closer to ground, it looked like his sanctum back on Ravnica. Large stone table with piles of books, maps, and several...contraptions that whirred and buzzed. Bookcases stuffed with books everywhere the eye could see, and he gazed at them longingly. 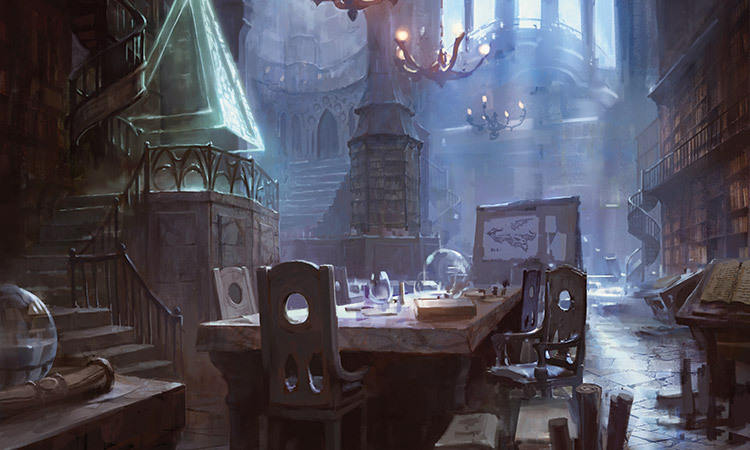 It didn't just look like his Ravnica apartments...it was them, except back on Ravnica there was no palatial staircase spiraling down in the middle. And back on Ravnica there was certainly no monstrous force destroying his sanctum from above. Emrakul. The name sounded strange even as he said it, a word he should not know, a word he could not know. Or perhaps that was the word underneath the word...Jace paused, chagrined at how effortless losing his train of thought was. Focus. Emrakul. A...thing. An Eldrazi. The Eldrazi. Jace's mind struggled to encompass the nature of the entity. His head hurt, a dull, pounding ache that grew with each contemplation of the Eldrazi titan outside. So don't think about it. Where am I? What is this place? A loud peal of thunder rattled outside and the ground quaked briefly beneath his feet. As the ground shook, Jace's head began to pound. 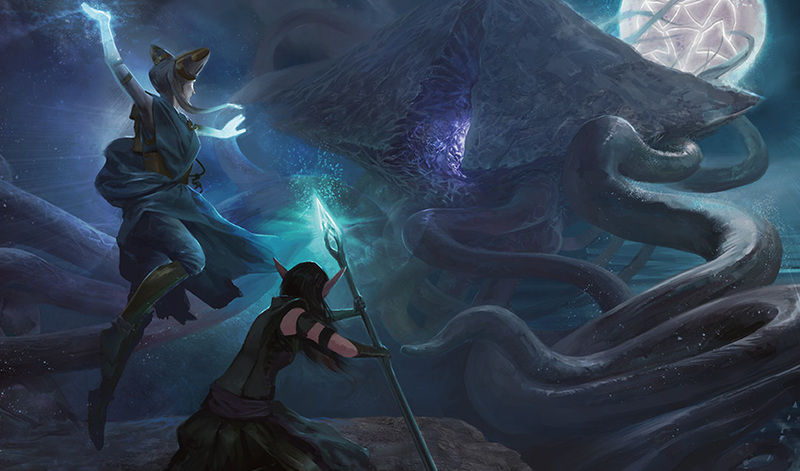 Lightning flashed, illuminating Emrakul's tentacles as they tore off more huge chunks of the stone structure. The tower was large and massive, but Emrakul was dismantling it stone by stone. A soft white light began pulsing deeper below in the stairway. The light beckoned. Normally Jace knew enough to distrust beckoning soft white lights in a place he did not know leading to even more places he did not know. But most normal situations did not have attacking omnipotent Eldrazi titans. The white glow looked like an increasingly intriguing option. There was a bright explosion outside, a long, deep purpleness followed by a deafening roar of thunder. The entire tower reverberated as lightning struck it. Jace crumpled to the ground in pain, his head throbbing with agony. What is happening to me? And then another voice, his voice, but coming from somewhere outside, spoke with the force of command. Move. Move now. Go downstairs. 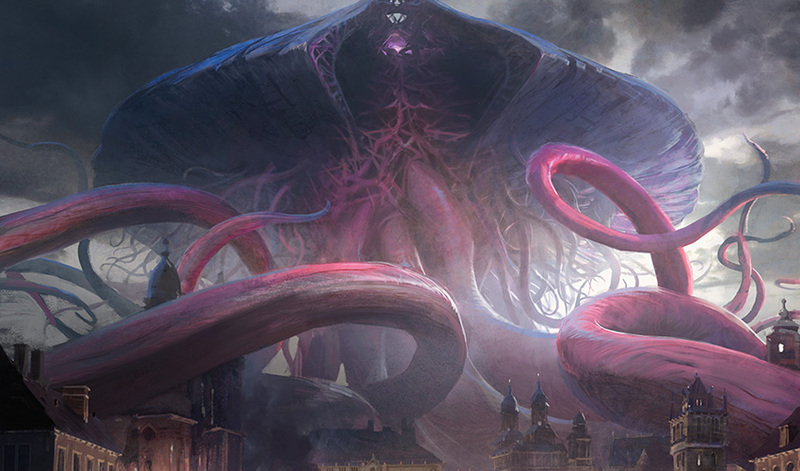 Jace looked up through the ruins of the tower into the ravening purple maw of Emrakul, its endless tentacles wrapping themselves around more and more of the stone bulwarks. He picked himself up off the floor and stumbled to the stairway. He decided the voice, my voice, was right. It was time to leave. He descended into the depths of the tower. Liliana's blood was on fire, her mind in shreds. One force kept her coherent—rage. Those are my zombies. Mine! You will not have them! Without conscious thought she drew deep on the power of the Chain Veil, and pushed back against the might of Emrakul. She could feel the Eldrazi's blighted touch, a touch now so powerful it affected even the dead. But even that baleful touch was no match for Liliana's necromantic prowess backed by the force of the Chain Veil. She felt her zombies return to her. The power coursing through her veins was exhilarating. Each previous time she used the Veil there was agony and rupture, but somehow this time her rage inoculated her from the worst of the Chain Veil's injuries. Perhaps that is the answer to unlocking the Chain Veil. I never wanted it enough. Voices still whispered to her from her zombies, and from the Veil directly in her mind. "Vessel of destruction. Root of evil." Those weren't the only voices she heard. The Raven Man added his stultifying tones. We must leave here. This is madness. I thought you wanted to conquer death. The entity you face here is older than time, and more powerful than you, even if you wielded a hundred Chain Veils! We must leave! The Raven Man tried to issue it as a command. Never had he sounded so naked, so vulnerable. Liliana spared a glance at the other Planeswalkers. Chandra, Tamiyo, and Gideon were sprawled on the ground, unconscious. She briefly reached out with her power, but their forms did not respond to necromantic touch; they all still lived. Nissa was rooted in place, screaming, the words emanating from her mouth gibberish. Green and purple energy pooled around her, clashing, ebbing and flowing. Jace was the only one who stood and seemed to be conscious, though he took no notice of her. She noticed a blue shimmer around him, a penumbra that extended to all five of the other Planeswalkers. All except her. Is that what's keeping you alive? The penumbra did not extend to her. But she didn't need his help. Liliana had known considerable power, power partnered with the wisdom and ruthlessness born from two hundred long years of life. But she knew none of that would have protected her from the mental onslaught from Emrakul. She would have been obliterated, except for the power of the Chain Veil. Power she now wielded, and wielded gladly. She laughed with the thrill of it. It was the closest she had yet come to the nigh-omnipotence of her former self. I can do anything. Still the voices of the Veil whispered in her head. Vessel. Vessel of destruction. We must flee the World-Ender. The World-Creator. Vessel! The Raven Man's voice choked with panic. Listen to the Veil, you idiot! Flee! Her zombies. "Root of evil. Vessel of destruction. Vessel!" 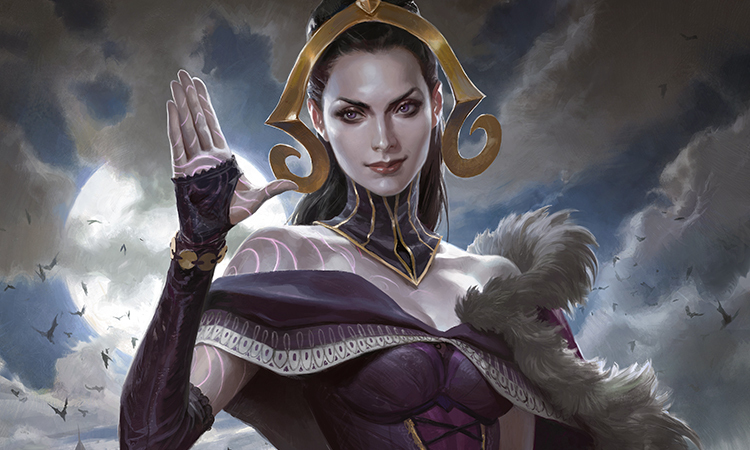 Liliana laughed, a laughter suffused with rage and power. "I. AM. NOT. A. VESSEL!" She shut down the voices of the Veil and the Raven Man both, silencing them abruptly. She could feel their fury and impotence as they railed against her. All that matters is my will. My desire. Nothing can stand before me. She tapped into the Veil, harnessing more power than she had ever dared before. I don't belong to you. You belong to me. She gathered the energies of the Veil, harnessed them to her own considerable power and experience. In the throes of such power she no longer felt Emrakul's mental assault. She turned her full attention to the gigantic Eldrazi titan. As if it recognized her growing power, the titan was moving slowly in her direction. Everyone seems to be afraid of you, Emrakul. She laughed again, a cackle as she reveled in her power. No one thinks I can beat you. Let's find out. As Jace descended he would occasionally glance up, but shadows obscured all but a few feet behind him. I guess these stairs only go down. He thought he should find being shepherded along an unknown corridor down into the depths of a strange tower alarming, especially accompanied by the continued assault and thunder he still heard above, but he was calm. Down here is definitely safer than up there. The stone wall next to him began shimmering. As he watched, the stone turned to glass, or at least some type of transparent material. The entire wall next to him, from steps to ceiling, transformed into a clear pane. Through the window was a scene, like a diorama children would make for school, but this diorama moved. The central figure in the scene was Gideon. He was squaring off against some kind of celestial being who towered over him. Literally celestial—the figure was made of a starry night sky. 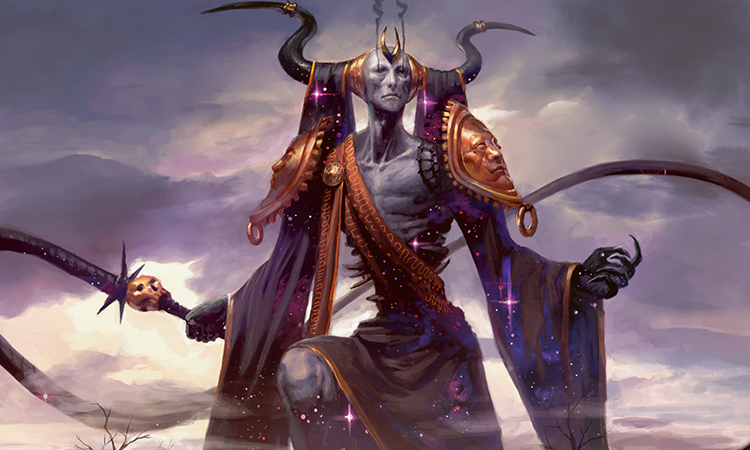 The celestial figure had two large black horns framing a blue, non-human face. He wielded an impossibly large whip with a human skull in the handle. Gideon looked suitably Gideon-esque, square jaw, golden sural, and gleaming armor intact. But the look on his face was not the Gideon Jace knew at all. This Gideon looked worried, almost scared. There was anger on that face...but also fear. Interesting. Around Gideon stood the other members of the Gatewatch. Chandra, her hands and head blazing. Nissa. Even a Jace. Surely I'm taller than that? The celestial figure spread his arms out wide, whip to the side. He spoke with a deep, resonating voice that seemed to bubble up from the ground. "And what is it you, Kytheon Iora, most desire? What do you truly want?" "No!" Gideon shouted, his face contorted in defiance and pain. "There is nothing you can offer me, Erebos, nothing! From you, all is poison." The being, Erebos, raised his whip. "It is not an offer, mortal. Tell me true what you most desire or I will kill your friends, one by one." Gideon's shoulders slumped, his sural retreated back into its sheath. He looked up at Erebos, his face a mixture of anger and despair. "I most desire..." he paused, drawing a deep breath, "I most desire to protect others, to save them..."
"You lie." Erebos's whip lashed out, and as it struck the Jace next to Gideon he disintegrated, his flesh dissolving upon its touch. I really don't like watching myself die. Gideon screamed and lunged, his sural flashing, but Erebos stood unmoved. He raised his hand and Gideon was flung backwards. "You cannot defeat me, mortal. You never have. You never will. Tell me truth and I will let the rest of your friends live." There was a loud peal of thunder outside, Emrakul, that's Emrakul, and Jace could not hear Gideon's reply over the din. Whatever Gideon's answer, Erebos was not satisfied. Once more the whip lashed, and now Nissa disintegrated with its touch. Gideon flinched as Nissa was struck down, but did not attack this time. Chandra stood there looking blank, her flaming hands at her side doing nothing. This scene is definitely not reality. Is it inside Gideon's head? Gideon's voice crackled with anger. "I want to defeat you, to tear you down so you can no longer..."
"No. You continue to speak lies." Erebos's voice, in contrast, was placid as a graveyard. Another lash of the whip, and Chandra vanished. "Must you lose everyone before you acknowledge truth, mortal? All your stubbornness to what end? You are determined to feel the most pain." Erebos's whip danced with its master's touch. "What do you want?" Gideon raised his head to the skies and screamed, "I want..." but before he finished his sentence the window went dark. Jace stayed still, silent, stunned at all he had witnessed. Who is Erebos? What pain is Gideon going through? Jace had had no idea his friend was suffering this way. And my ignorance about Gideon is matched by my lack of knowledge of what is going on here. Are these dreams? Am I inside Gideon's head? The Emrakul above certainly seems real. The shadows pressed closer to Jace. I need to keep moving. The answers are farther down. He had only walked several steps when another wall went transparent. This time the scene featured Tamiyo. She sat hunched on a small workbench, poring over a large unfurled scroll on a dusty table. The sole illumination in the scene was a candle, but it gave off far too much light for its size. Behind Tamiyo were shelves full of books, and more piles of books beside them. Jace felt a nostalgic pang. To be surrounded by nothing but books and all the time to read them. That hadn't been his life for some time now, and wouldn't be again any time soon. Blood began leaking from one of Tamiyo's eyes. It started with a slow drip, each drop hitting the table with a small plip. As she continued to read the scroll, the other eye began dripping blood as well, each drop alternating with each other. Plip-plip. Plip-plip. Plip-plip. Jace watched in horror as flesh-like lattices began to grow over Tamiyo's eyes, covering them entirely. The mark of Emrakul. Jace had seen too much of Emrakul's signature over the last few days. The blood continued to drip through the lattices. Plip-plip. Plip-plip. Plip-plip. The lattices blossomed elsewhere. Fleshy growths burst from Tamiyo's fingers, covering both hands in the weblike structures. The growths attached to the table beneath, sticking, binding her hands to the table. Now she could no longer see nor move her hands. The blood kept dropping from her eyes. Plip-plip. Plip-plip. Plip-plip. As she lost the use of her eyes and hands, Tamiyo whispered throughout, though no audible sound emerged. 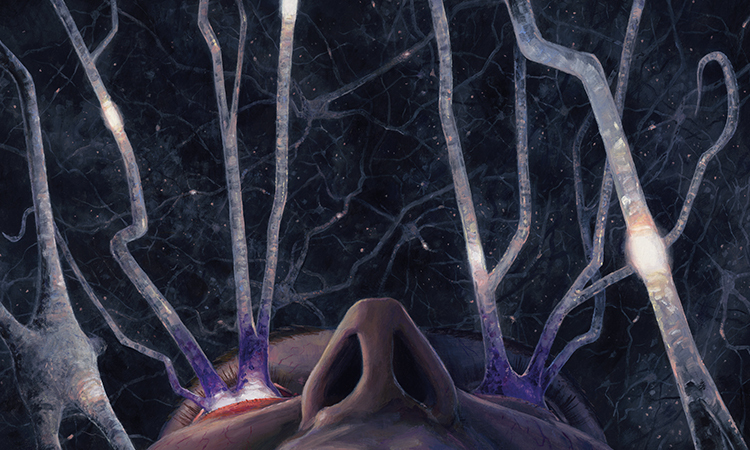 The fleshy tendrils began webbing her mouth closed, lip tied to lip with each strand of Emrakul's web. Even once her mouth was sewn shut, the lattice continued to grow, to wiggle and writhe. The tendrils extended far out from her closed mouth, and now as the blood continued to drip from her eyes the tendrils would seize a drop, curling around it, wiggling as the blood seeped into its oily skin. Plip-wiggle. Plip-wiggle. Plip-wiggle. Tamiyo was motionless, her eyes, mouth, and hands frozen. Jace had touched Tamiyo mind to mind, knew the essence of her better than most. Her ability to see, to speak, to write, these are the essential tools of her magic, her communication. These are what define her. She is being erased. Jace screamed and pounded on the window, but neither Tamiyo nor anything else in the room stirred. The window faded to opaque stone. Jace slumped. What is this place? This cannot be the minds of my friends. Can it? The shadows loomed over him. He was tired, so very tired. He slowly picked himself up and continued his descent. This power. It is a revelation. All it had taken was Liliana's will. Her desire. For so long she had thought herself utterly pragmatic and driven to her cause. To not die. To kill her demon tormentors. But now she knew she had been unwilling to take that final step, to cross over the last barrier. I had restraint. How foolish. In front of her loomed Emrakul. An Eldrazi titan. A creature older than time, if the voices in her head told truth. I think you are a thing. A powerful thing, but something that lives. And if you live, you can die. And if you die, another smile, then you belong to me. The energies of the Veil writhed and bucked under her control. They wanted to be used to wither, to kill. Power is meant to be used. She gathered it, shaped it, and sent one coruscating blast of necromantic energy after another at the towering figure of Emrakul, hurling the titan back with their force. There was a song in Liliana's head, a song blotting out all else. It was the song of power and it sang such a sweet melody. This is what I was born for. This is my destiny. Each blast that hit Emrakul left gaping trenches of scarred dead material, large tentacles the size of towers left shriveled and withered. Some of the material regenerated, but not enough before being hit by Liliana's next blast. For the first time since blossoming, Emrakul was shrinking. It was being thrust back. Liliana was winning. The Raven Man's voice cut through her delight, a cold splash of sewer water. You know not what you do, what you dare. You cannot hope to contain this power for much longer. Liliana's scorn draped each word she thought back in reply. Do not seek to contain me with your small expectations, little man. Today is the day I destroy an Eldrazi titan. Why? Because I dare. She wished the Gatewatch was conscious to watch her victory. This is what power looks like, you pathetic excuses for Planeswalkers. She flung more blasts at Emrakul, pressing her attack. Jace was not surprised to see the another window appear shortly. This time it was Chandra. Or at least he assumed it was Chandra. She was a little girl, but the red hair and shape of her face still suggested the woman she would one day become. Chandra was surrounded by a menacing group of guards, their gear ornate and colorful, from a place Jace did not recognize. Her home. The guards raised their pikes, and Chandra was sobbing, tears fighting with gasps of breath for control of her face. One of the guards, tall and spindly, stepped forward. His face had a wide smile on it, in cruel contrast to his awful words. "We killed your daddy, renegade. We killed your mommy. And now we're going to kill you." Jace suspected the scene wasn't real, just a nightmare in Chandra's head, but his fists still balled up. No one should have to endure this kind of pain. The guards moved forward with their pikes as their leader sneered, "And the best part, the absolute best part, is there is nothing you can do about it." Chandra stopped crying and stared at her persecutors. A tiny wisp of flame flared from one eye. "You're wrong," she said, her voice not sounding like a child's at all. "There is something I can do." Her body was changing, growing, evolving before his eyes into the recognizable Chandra he knew. "Something I can always do. I can burn." Fire jetted from her head and hands. She smiled. The guards backed away, uncertain. She took a step forward. "I can make you burn." The leader burst into flame. He screamed in agony. "I can make all of you burn." Now the other guards were on fire, their skin crackling and bubbling, their high-pitched cries piercing the sky. "I can make the whole world burn." Heat and light and fire burst forth, an incandescent whiteness of energy, enveloping and burning everything, including Chandra. Chandra screamed, though whether in agony or delight, Jace could not say. The window faded to stone, but Jace still felt the heat pouring off the walls. It was one of the first principles of illusions. Just because it's only in your head doesn't mean it can't kill you. Gideon, Tamiyo, Chandra...but no Liliana yet. Urgency propelled him downstairs and he looked eagerly as the next window appeared. His face fell when he saw the figure behind the wall. Oh, Nissa. He tried not to be disappointed, though he found it hard to understand the elf Planeswalker. The background behind Nissa looked exactly like the outside world—the dark, purple sky, the odd flashes of light, the looming shadow of Emrakul, Liliana and her zombies. Nissa stood in agony in the center. She screamed. She writhed. Twisting, contorting, shaking, but those were not the only injuries done to her. There was something...wriggling...on her hands. As Jace peered closer, he noticed Nissa's fingers had tiny fingers growing on them, tens of tiny fingers extending out of each finger. And then he saw hair-thin fingers growing out of the tiny fingers. He shuddered, but as he saw her eyes he let out an involuntary scream. From each of Nissa's eye sockets protruded several tiny eye shoots, and out of each eye shoot grew several tinier ones. Green energy flashed out of her eyes and hands, but interlaced in the green was a dark, violent purple. Emrakul is Emrakul is Emrakul forever. "Negglish pthoniki ab'ahor!" 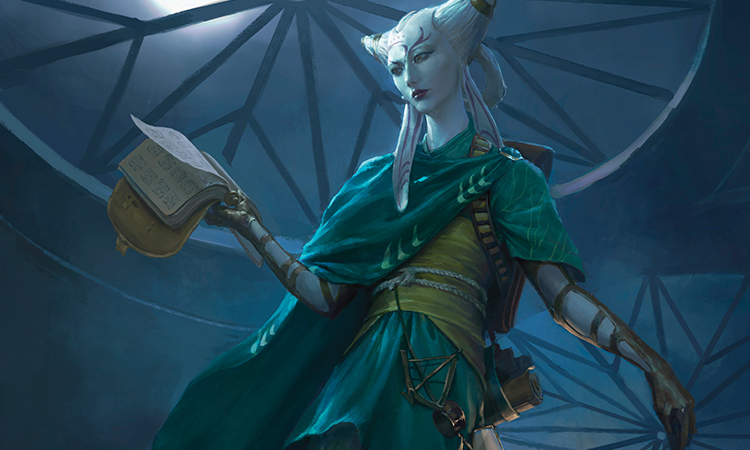 gibberish words spouted from Nissa, or if not gibberish then no language Jace had ever heard. As she spoke, her head spasmed, and in between words her tongue would loll out of her mouth. What are those things on her tongue? Oh, no. No no no no. I am hitting the limit of details I want to notice. No, I am well past the limit. As nonsense and spittle spewed from her mouth, rational words began to infiltrate the gibberish. "Shigg epsi-everything chut'ghb ends! Gilma-everything chts-dies!" The spasms subsided, her voice gaining strength and poise. Now the energy emanating from her was all purple, a deep purple with no green to be found. She raised her head and arms to the sky and shouted. "Growth! Growth is the answer! The only answer! Entropy cannot lose. But must it win? Of course sacrifice must be made. Why do they fight it? Eternity without sacrifice offers only the screaming torpor. Blood must be churned, churned thick. Why do they fear life? Why do they fear truth?" Nissa uttering recognizable words made no appreciable impact on Jace's ability to understand her. Even though he knew it was useless, he reached to her mind to mind. Nissa, help me. Help me understand. What are you saying? 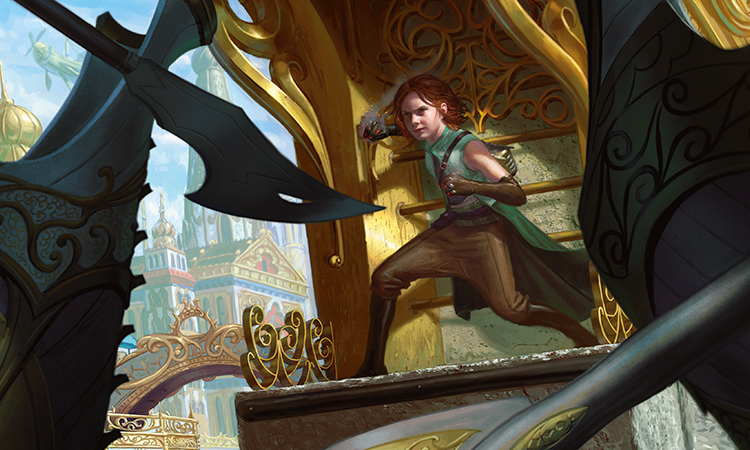 Nissa shifted and brought her gaze to meet Jace's directly through the window. She sees me. Jace shivered, frozen to the spot. He could not move, could not look away. Her eyes glowed darkly purple. She spoke directly to him. "I can do anything I want. Anything at all. Remember that. The only thing saving you is..." the purple glow faded, the nimbus around her dissipating, "...I don't want anything." She stared at him for long seconds, her face distorted and grotesque as her extra eye shoots continued to squirm. The window mercifully faded to stone. Jace remained frozen in front of the wall. He shook, sweat beading down his hair onto his face and the back of his neck. The shadows continued to press from above. How long have I been on these stairs? What is happening to my friends? Down still beckoned, brightly lit and pulling at him. But he didn't want to move. He didn't want to do anything. Sleep. I could sleep. I might not wake up, but would that be so bad? His eyes drooped, and a pleasant fuzziness crept over his mind. He sat on the stairs. I am so tired. Drifting off to sleep made him think of Liliana. He didn't know where she was, or what she faced. She isn't here. She's not in this place. But if he acknowledged the truth, she never needed him anyway. "Sad. For a while. And then I'll get over it." That's what she had said back in her castle, comparing the possibility of his death to that of a dog's. A dog. Would she really not care any more about my death than a dog's? That can't be true. A dog. The thought gnawed. Sleep, how could I possibly be thinking of sleeping right now? What is happening to me? He couldn't tell whether it was true exhaustion, or a more malevolent effect. Does it matter? The solution is the same. He stood. Keep going downstairs. Figure this out. Don't die. Beat Emrakul. He thought of Liliana as he continued his descent. The first sign of trouble was an interruption to her tempo. Liliana had never wielded so much energy before, and she had been able to fling blast after blast at Emrakul with each breath. Breathe, blast, breathe, blast. But though her power didn't fail her, her body did. 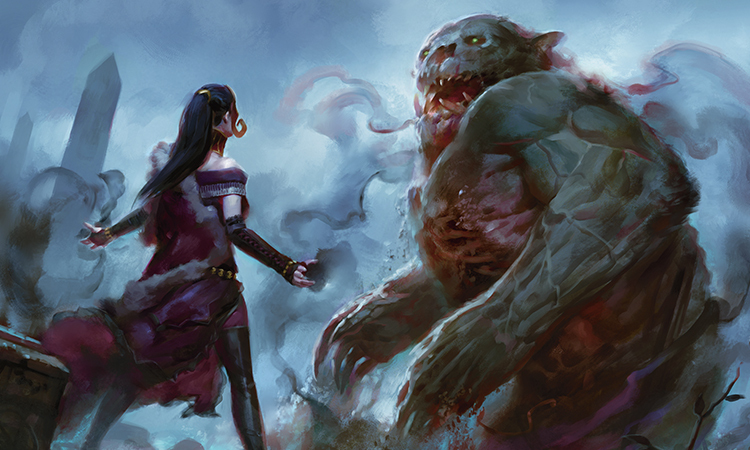 She hesitated for a second, took a long breath, and in that gap Emrakul surged, its body and tendrils regrowing at a faster pace than Liliana thought possible. Several thick tendrils lashed at Liliana only to wither and desiccate at the touch of her magic, but several more quickly followed. Where once each blast from Liliana drove Emrakul back, now it was all she could do to stand her ground. You are mortal. You have limits. It does not. The Raven Man's voice stabbed her brain with cold whispers. Look upon this grass and dirt, you fool. You have made it your graveyard. She screamed in rage as she let loose more blasts of power. The titan's advance halted in the face of such an onslaught. But seconds later the energy ebbed. Liliana took large gasping breaths and Emrakul's advance continued once more. I am not going to die today, she snarled to the Raven Man, to the Veil, to anything that would listen. To herself. Emrakul and its tendrils continued their unceasing assault. I am not going to die today. If you're lucky, Liliana, your death is now the best possible outcome of today. You have doomed us both. The Raven Man spoke without contempt, without hatred or fear. He sounded...resigned. For the first time since rescuing the Gatewatch, Liliana was afraid. Jace expected another wall to turn transparent, to show him a scene from the mind of Liliana. What he did not expect was the stairway to end in a door. It was a thick oak door, banded with iron, with no port or keyhole. Just wood and iron, framed in the same thick stone as the rest of the stairway. He put his hand on the door. A voice screamed, no no no no no no, and pure terror seized his brain. But the voice trailed off, the terror receding. Jace looked up the stairs. The shadows did not press closer but nor did they part to reveal the way he had come. If he wanted to progress, it was through this door. He pushed the door forward and stepped through. The room was formless and colorless. Vertigo overcame him as his mind struggled to perceive the space. Jace felt the long pull of forever, an endless recursion looping into terror to never know the peace of oblivion to just to just to just...until reality snapped into place. The nothingness surrounding him materialized into a field of white. There was an angel in front of him. Her face was hidden by a large hood, but in very plain sight were the two swords she carried, one in each hand. Her tunic frayed at the hemline into ribbons, tens of ribbons, no, hundreds, and they seemed to multiply as Jace watched. They wriggled and writhed. As if they noticed Jace, the ribbons of her tunic probed the air in front of him, alive. If I scream, I don't know if I'll ever stop. So I better not scream. Would crying help? I'm open to crying if it will help. Jace laughed in a combination of amusement and fear. I'm so glad I find myself funny. The laughter broke through the paralysis, sparking his mind. I know this angel. I have seen her before. Or at least he had seen statues of her before, back on Zendikar. "Emeria?" he croaked, the word sounding foreign on his lips. She looked at him, but he could not see her face cloaked in the hood. Jace took careful note of the ribbons and the swords, but nothing moved to attack him. His confidence grew. "Are you...are you...Emeria? Are you...Emrakul?" "May I sit down?" The voice was a female voice. Light, almost airy. Jace might have even said it trilled, in different circumstances. Not these circumstances, though. Jace couldn't see any lips move through her hood to produce the voice, but it sounded like a normal voice. Normal-ish. Jace was so busy analyzing the voice it took him a moment to parse what was actually asked. "You're asking me?" Of all the surprises of this day, getting asked a polite question should not have ranked high on the list. But it might be at the top. "This is your home," a pause, "Jace. Jace Beleren." As she said "Beleren" it came out syllable by syllable. I'm very afraid right now. I'm also so very curious. What an odd juxtaposition. "I am just a visitor here. So, may I?" She stood waiting. How much more surreal can this day get? He was confident he didn't want an actual answer to the question. Remember what's important—don't die. Figure this out. Beat Emrakul. His mantra. He added another sentence. Invite Emrakul for a cup of tea. He smiled, and the smile reached his face. "Please, by all means. Please sit down." Jace waved airily at the large stone table, and Emeria—no, I don't know what this is, stop assuming I do, the angel sat down at the table. She sheathed both of her swords behind her back. When her hands came back to the table they were holding a large scroll, a scroll with iron bands. I've seen a scroll like that before. Where? "You do not mind if I work while we talk, do you?" Her lilting voice sounded like it could come straight from an Azorius guildmage wanting guidance on a point of protocol. Embrace this surreality. Stop fighting it. See where it goes. "Of course, please. I would not want to keep you from your work." She nodded and unrolled the scroll. A creeping sensation nagged at the back of Jace's head. Where have I seen that scroll? But he could not place it. From somewhere a long stylus appeared, and she began writing in the scroll. Jace cleared his throat. "Well, since we're, umm...you know, having a talk. Who are you exactly? What is this place? What is going on?" Jace could not afford to be picky about where to get answers from. He could not quell his normal instinct to mind-read, not knowing is so much worse than insanity, but there was...nothing. Nothing he could latch on to. Secrets are no fun when they stay secret. He was going to have to do this in the mundane style everyone else had to. Through words. Words with an Eldrazi titan. "Everything ends. Everything dies. Wholeness is always behind us. Time points only one way." There were echoes of Nissa's earlier insane comments, but Jace didn't understand it any more coming from the angel. She didn't look up as she wrote, her hood obscuring whatever light voice uttered those strange words. "Are you Emrakul?" Jace didn't know what he was risking, and increasingly didn't care. Caution is for those with a winning hand. "What do you want?" She paused her writing, considering the scroll. "This is all wrong. I am incomplete, unfulfilled, inchoate. There should be blossoms, not barren resentment. The soil was not receptive. It is not my time. Not yet." The way she said, yet, sent a shiver through Jace's neck. She resumed her writing, blotting out a large section of dried ink. "Enough!" Jace shouted. "You are here for a reason! You could kill me any number of ways, with your swords or your tentacles, but you're not. You're sitting here, uttering nonsense...why? I don't understand what you're saying and I don't understand what you want. Help me. Please." As Jace talked his anger cooled, but it was replaced by something even more useful. Focus. He felt a fog clearing, a fog that only in its recession revealed how much it was obscuring. "Do you play chess?" The voice continued as if Jace had been spouting as much nonsense as she was. Jace was tempted to shout again, but didn't think it would do much good. Besides, he did play chess. He was quite good at it. "Would you play a game with me?" She stopped writing and rolled up the scroll. "I'm not sure I have time to play..."
"If you win, this all stops. I will give you all the answers you want." She tucked the scroll behind her. Jace suspected a trap, but he was really good at chess. "And if you win?" "I am already winning, Jace Beleren. Let us play a game." "Uh, there is one problem." Jace glanced around. In his real apartments back on Ravnica there was a chessboard, a quite fancy one he had been gifted by the Boros, but in this strange simulacrum, no such board was visible. "I, uh, don't seem to have..."
The angel waved her hand, and a chessboard appeared on the table taking up the space where the scroll used to be. The board and pieces were thick stone, solid with fine detail. Jace raised an eyebrow, but if the angel noticed, she made no sign. I suppose if she just limits herself to creating chessboards, we will be okay. "Shall we play?" She gestured toward the board. Jace's side was white, and he took the first move. Magnanimous of her. "You will need to move faster, Jace. Time is running out." Faster? He was moving near instantaneously. She did not seem a particularly skilled player, and Jace began to see the outline of a possible checkmate in six or seven moves. "Communication between us is difficult. I cannot talk to you. I do not even really know you exist. But you, your brain, it is very...adaptable." There, a blunder. He had mate in five moves. Confident of his victory, he paused. She was saying actual information he could use. "So, then, what is all this?" He waved his hands around them. "What are you? How does my adaptable brain make this happen?" "You know those answers better than I." She put her hand on a piece, hesitated. "Or, at least, a part of you does. How is your headache?" How did she know about my headache? In truth it was reduced to a low residual throb, noticeable but not debilitating. "It's...it's fine. So you are not Emeria? Are you even real?" "I was personified a long time ago. Forces cannot be reasoned with. Agency does not exist in propagating waves. If you take shortcuts to try and grapple with what you cannot perceive, cannot even comprehend, who am I to gainsay? No one. You. Perhaps." Enough. He put his hand on his queen, moved it into position. "Checkmate." He smiled. He was not sure what winning this game meant, but it felt good to win, to win something. She stopped, looked at the board. "So it is." She put her hands to her hood and lowered it. Jace flinched instinctively, suddenly certain he did not want to know what she looked like...but she looked normal. Like an angel. Like the statue he had seen back on Zendikar. He took a long, slow breath, exhaled. One of the pawns beside his queen started to writhe and flow. Hands and a small stone sword appeared on the pawn, and it turned to stab the queen. The queen piece shrieked, blood pouring out of its side. It toppled to the ground, bleeding and shaking. Dying. The rest of the board was pandemonium as more of Jace's pieces transformed. Mutated. They attacked one another mercilessly, killing each other, until the few remaining pieces pirouetted to face the other side of the board. They now all held weapons, weapons dripping with blood, and began a slow march towards Jace's king, who now resembled nothing other than Jace himself. Jace gaped at the chaos. "Wha...buh...tha...that's...that's not fair! You cheated! You can't do that! Those are my pieces!" The angel's face began to melt, chunks of flesh sloughing off as the rest of her—wings, swords, ribbons, and all—began to dissipate into a purplish smoke. But the voice remained. "They are all my pieces, Jace Beleren. They always were. I just no longer want to play." There was a huge crackling explosion outside accompanied by a large grinding sound. The top of the room was torn away, revealing the now-familiar sight of Emrakul, the gigantic mushroom cloud with its hundreds of tendrils and flashing lightning, eating away at the room. The voice continued, light and airy as a breeze. "It is coming, Jace. I am coming. Keep moving. Find your answers. But quickly. Time points one way, and it does so with hunger." A door appeared at the end of the room, ornate with a bright blue glow behind it. Jace took another look at Emrakul above, and fled. Liliana did everything she could to stay alive. She had been using some of her power to hold back the effects of using the Chain Veil. She kept her skin from cracking, her veins from spilling blood. In taking over the Chain Veil completely, she thought she had discovered the secrets to its true use. But as agonizing as her skin splitting and her veins rupturing was, it was better than oblivion against the onslaught of Emrakul. She still drew on immense amounts of power, but now all that power was put to one use. Staying alive for another moment. Her moments were running out. As Emrakul lashed and flayed against her magic, she directed her zombies to attack. They bit, grabbed, struck against Emrakul, like fleas versus a storm, with similar effect. 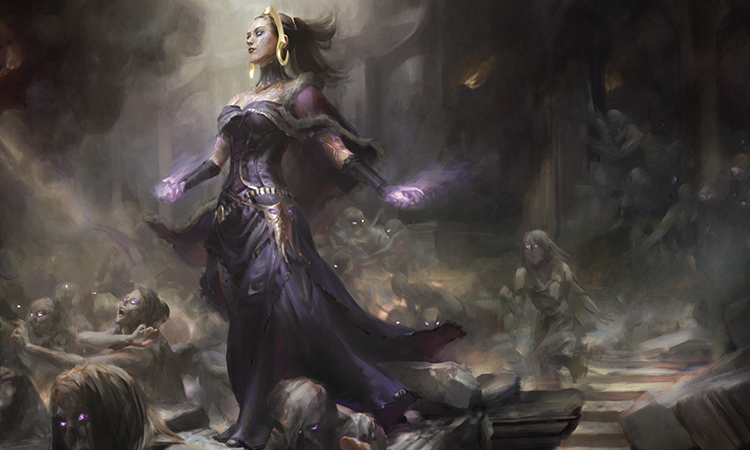 Zombies were destroyed by the hundreds under Emrakul's assault, and hundreds more disintegrated without touch as Liliana instinctively drew upon their animating magic to fuel another moment of survival. If there was any consolation in her impending defeat, it was the blessed silence inside her head. There were no voices from the Raven Man, no chanting or whispers from the Veil. Even as her reality was blood and pain and a desperate fight to stay alive, her mind was hers and hers alone. There was consolation there, if she chose to take it. A large tendril, thick as her torso, broke through and grabbed her around the waist. She screamed in rage and blasted through the tendril, its desiccated flesh sloughing off. She coughed up blood, swaying, even as more tendrils came. She was going to die here. She looked at the other Planeswalkers, their bodies still protected by the large clearing her dwindling zombies provided. Nissa was no longer screaming, but lay unconscious like the rest of them. Only Jace stood, the blue shimmer still in place protecting them from...something, but he didn't move, didn't speak. "Jace!" Her scream produced no response. No sign of recognition. Jace flung himself through the open portal, seeking refuge from Emrakul's assault. 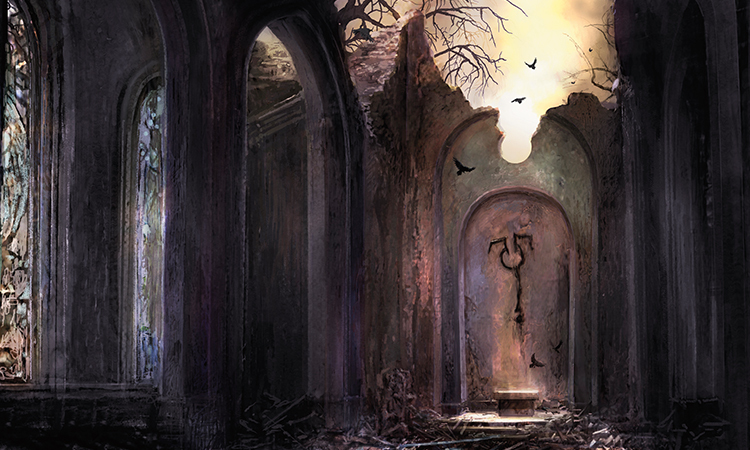 He was in a small, dark room, a copy of one of his innermost sanctums back on Ravnica. There, standing in front of him, was himself. With all the other insanity Jace had experienced since first waking up in the tower, facing himself was one of the more benign confusions. The copy didn't smile, didn't move. "You got here. About time. But I don't know you're me." He pondered for a moment. "Answer this riddle." "What? I'm done with riddles. I need answers. What—"
"First, a riddle," the copy said. "You must be joking. I'm not going to stand here and get quizzed by either a runaway tyrant version of myself or, worse, some malignant impostor who just wants to waste my time!" Jace ended his rant with an angry shout. The copy stood there with a smug smile and a raised eyebrow. Am I really this infuriating? I am this infuriating. I need to work on that. "It's only infuriating when you know I'm right. I need to know you're me." Jace wondered if there would be permanent consequences to punching himself in the face. Probably. "How do I know you're me?" It wasn't the snappiest retort, but it was all he had at the moment. His brain was processing a lot right now. "Because I'm the one with answers. You're wasting time, time we don't have." The copy tapped his foot in a way Jace recognized all too well. I don't know that I can ever interact with another human again. I'm too annoying to be with. He slumped his shoulders and waved a hand. "Fine, ask away." "No bigger than a pebble but my closing covers the entire world, what am I?" "That? That's your riddle? Your security system to make sure I'm you? You must be an impostor, because I refuse to believe I'm that dumb." "You still haven't answered the question. This conversation is going to end quickly if you don't." The copy's eyes glowed blue in a way Jace was perversely glad to find menacing. It's good to be reminded you can menace now and then. "Pah. I thought I would have come up with something difficult. Eyes. The answer is eyes." Jace stared at his copy, and then blinked ostentatiously several times to illustrate the point. "I see the whole world. Now I don't. See. Not see. How could this riddle possibly have been useful?" The copy relaxed, letting go of whatever spell he had prepared. And then Jace understood. The point of the riddle wasn't to see if he solved it. The point was to see how dismissive and incredulous he was at an easy riddle. He nodded. Okay, this is me. He knew the copy was thinking the same thing. "Fine, I'm me. I mean, I'm...yes, we're each other. Probably. You promised answers." Jace reached out to read his copy's mind, but nothing happened. "That's not how it works here. Here, we talk." Another coy smile. "All right," Jace struggled not to clench his jaw. "Talk. Now." The copy pondered briefly. "I still don't know all the things you don't know. Ask me questions." "Where are we?" Jace wasn't sure it was the most pressing question, but he had been wandering this forsaken tower for the last hour, and he really wanted to know where he was. "Really, that's the part you haven't figured out yet?" You condescending...Jace's anger was not abated by the fact that the condescension was coming from himself. And in that flash of anger he understood. Jace remembered. Emrakul rising, flowering, blooming. 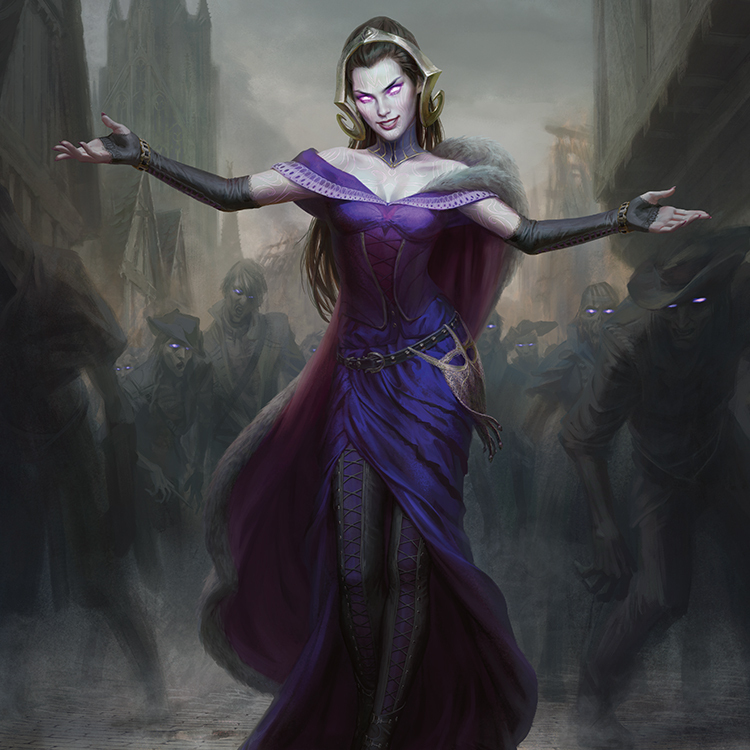 Liliana had given them all a momentary relapse from Emrakul's minions with her zombies, but none of them were prepared for the rise of Emrakul itself. The physical signs were apparent, but the mental assault was the real danger. A pressure, a pain, unlike any other he had felt before. Tamiyo's chime trick instantly dissolved. There had been no time for a plan, no time for thought. The spell he had cast was reflexive. One he had prepared a very long time ago, to shield his mind from imminent dissolution. He shook his head rapidly trying to clear the fugue, noticing his copy did the same motion at the same time. The pressure from Emrakul was increasing. Jace looked up and noticed the top of the room shaking. It's attacking. It's coming. "Innistrad was a weird place. A dangerous place. As soon as I arrived I knew something was wrong. I set up some...fail-safes in the event of something disastrous occurring. Puzzles within puzzles, shadows within shadows. 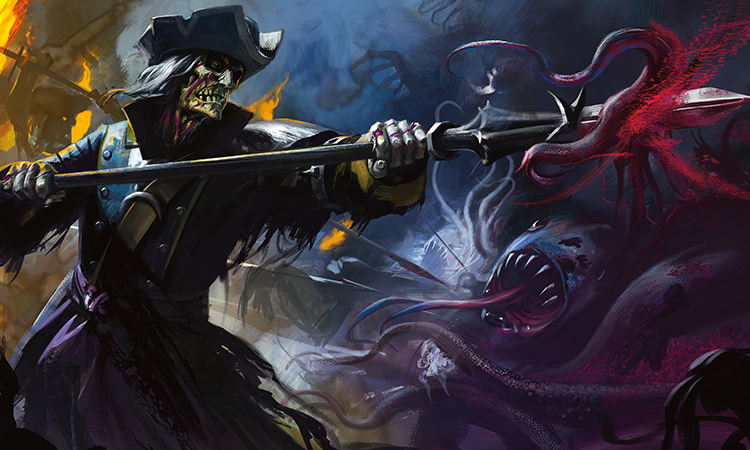 Emrakul is the scariest thing I, we, have ever faced. So I made a contingency plan to keep me separate from me. To work out what was really going on, and be able to stop it. Fix it. You know." And now he did know. He was so good at self-alteration. He shivered, wondering which him was the real Jace. The better Jace. Nonsense. It's me, of course. "Hey there," the copy smiled. "Don't get ahead of yourself. You're only the second smartest person in this room." "Enough." Jace's mind was starting to whir at a speed both familiar and comforting. "The plan. I better not have created you just for you to tell me a dumb riddle. 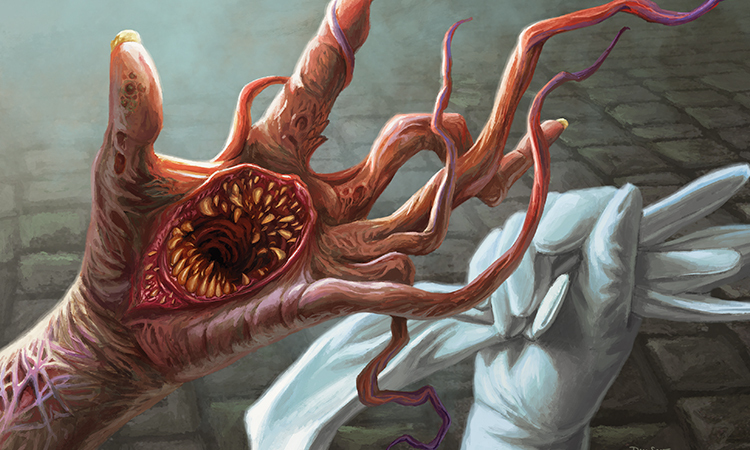 We don't know how to beat Emrakul." "Talk with Tamiyo. She was in the middle of telling us interesting things when Emrakul attacked." "That's your useful input? Talk with Tamiyo?" "No, my useful input is actually figuring out how to have all of us walk and talk and think normally even with the psychic equivalent of a Rakdos-Golgari kill-party times infinity hammering away at us. It's a fairly difficult trick, in fact." "Oh. Well, thanks, me. Good job." "Everyone is in pretty bad shape. But at least we will be able to think coherently. It's...not good out there. And there's another problem." "What's..." even as he asked the question, the answer flowed in his brain. The two parts of Jace were merging, becoming one. There were words, but the words were spoken by each of them at the same time. "Liliana is about to die." Jace dissolved the spell. The tower faded into reality. He came back to chaos. Liliana was on the ground in front of him, unconscious, bleeding profusely from multiple wounds. Above them Emrakul hovered in her full unfolding, a bright lavender light glowing in the center of her body, the eye of her storm. Her tentacles, broad and thick, decimating what was left of Thraben. Liliana's zombies were a mere fraction of what they had been before Jace's spell. The humans and beasts infected by Emrakul's madness had started to mass again, threatening to break through. Fending off Emrakul's mental assault was not going to be of much help if her minions tore them to shreds instead. The other Planeswalkers had regained consciousness a moment after Jace, staggered and disoriented. Jace funneled focus at his friends, clearing away the cobwebs of Emrakul's attack. 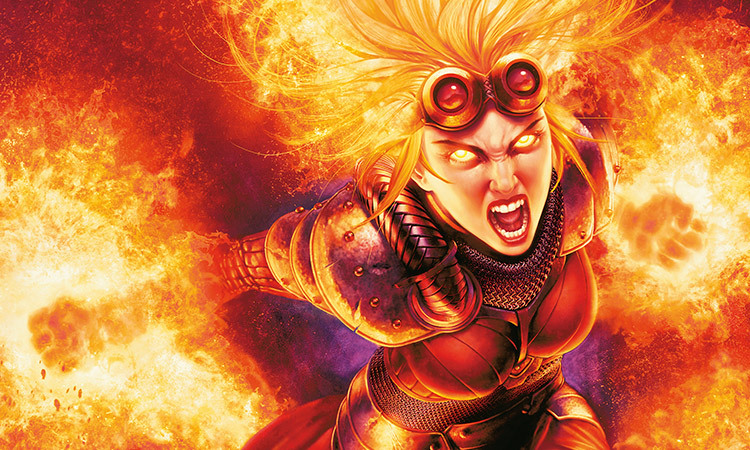 Chandra, Gideon, Liliana's zombies need your help. We cannot let Emrakul's minions through. Gideon moved first, with a soldier's decisive speed. 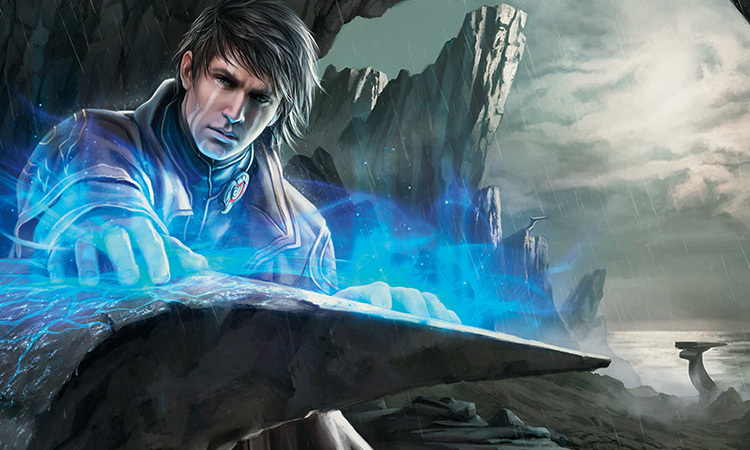 An image of Erebos's whip flashed through Jace's mind, but he shook it away. Chandra paused. I can...I can still try to burn her. I got this. Her hesitation vanished, replaced by a natural confidence Jace found both appealing and mystifying. She doesn't play at confidence. It just comes to her. Weird, he thought to himself. Jace hesitated. Trying to burn Emrakul didn't feel right, didn't feel possible. But how could he be sure this wasn't just head games Emrakul was playing with him, with all of them? Emrakul had been in his mind. He had felt her power. He cast his thoughts to the whole group, his spell of protection keeping their minds linked. No, Chandra. Emrakul is too big. Too powerful. We can't beat her that way. I'm not sure she can be destroyed. Jace is right. Trying to burn Emrakul is throwing a torch into the ocean. It will not work. Even if all the leylines were available. She is too...vast. Nissa's voice sounded odd, distant. She was weaving vines, shoots, and leaves into poultices to wrap around Liliana's wounds, keeping her alive. Emrakul was there, at my awakening. At the moment of my spark. Perhaps it is fitting she be there at the end. Oh, wow, you do not get invited to many parties, huh. Chandra's playful voice belied her words. Enough doom talk. More how-we-win-this talk, please. I'm gonna go burn things. Chandra ran to the outer ring of the zombie horde, her flames beating back crazed cultists. Jace. Remember what Avacyn said. Tamiyo's voice, a light breeze on a sunlit shore. An echo chimed in his head, a mad angel saying her last words to her creator. What cannot be destroyed must be bound. Jace, that is the answer. That is what we must do. We cannot destroy Emrakul. We must bind her. Tamiyo's voice was insistent, clear. The Gatewatch had faced this same crux back on Zendikar, and there they had chosen destruction. But that was not a choice on Innistrad. Emrakul was beyond their powers. The only destruction in question was their own—along with everyone else on Innistrad. How? Binding her may not be any more possible than destroying her. What prison could possibly hold her? The same prison that held all of Innistrad's horrors for hundreds of years. The Helvault? Jace was confused. Wasn't that destroyed? Nissa had been silent as she continued infusing her mana into the poultices wrapping Liliana. Liliana was breathing evenly, though still unconscious. Jace felt a warm surge of gratitude toward Nissa, but now he needed more from her. Far more. Can you power the spell? Nissa's voice was cool, serene. No. There are so few leylines here I can touch. So few I want to touch. Jace paused, uncertain of what to say next or how to help her. But I owe you, Jace Beleren. I will try. My mind was not my own. I was trapped in a darkness brought by her rising. I was subsumed by her, far too easily. It was not...pleasant. You rescued me from that horror. You have a gift for making difficult things so very easy. I will do what I can. "Thank you" suffices, Jace. You also have a gift for making easy things so very hard. I am ready. Jace didn't know how to respond to that, so he didn't. Tamiyo, are you ready? Tamiyo had pulled out a scroll. Another memory flashed through Jace's mind. The angel took out a long scroll, a scroll with iron bands. That was where he had seen Tamiyo's scroll, in his mental conversation with Emeria. But the scroll Tamiyo had chosen did not have iron bands on it. Jace had no more time to ponder the mystery. The space around them was shrinking. Gideon and Chandra were each holding off Emrakul's minions by themselves, but they couldn't be everywhere at once, and the zombies were close to being overrun. It was time. I am ready, Tamiyo confirmed. She began reading her scroll. Jace couldn't focus on the words, he was lost in the details of attaching Tamiyo's spell to Emrakul, using the knowledge gleaned from Ugin and his own hedron manipulations back on Zendikar. A glyph flashed onto the moon, incised lines glowing bright against the silvery reflection. He had to fasten that glyph onto Emrakul, the presence of Emrakul. But the spell demanded power. Streams, torrents, of power. Nissa strained against the earth, her eyes a bright glowing green as she wove the polluted fragments of mana left on Innistrad into something Jace could use. Jace could feel her draining the leylines, looking for every last bit of energy. It was not enough. It was not going to be enough. Nissa stumbled to the ground, her arms flailing. They were going to lose the spell. As Jace struggled to keep the spell going, he lost mental contact with Tamiyo. Where she had been in his mind, there was now just a cloud, a dark gray fog he could not penetrate. Tamiyo pulled out another scroll, a long scroll, a scroll with iron bands, and began reading a second spell. Energy flowed into Jace. He was in a wide river of mana, more magic, more energy than he had ever felt before. It felt wonderful. 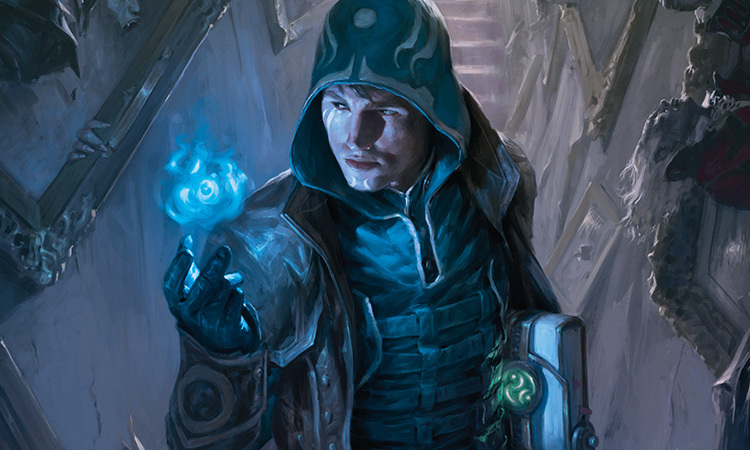 He took the magic, shaped it, each point on the glyph attaching itself to a node on Emrakul that Jace created on the fly. Jace unleashed the full power of the spell. Light erupted from the moon. A cold, silver beam struck Emrakul from on high. It bathed the creature, enveloped it...and the creature stretched. Toward the light, toward the moon. Emrakul folded, collapsed. She crumbled like a thin parchment sprinkled with glass, compacting to nothingness in a way no creature Emrakul's size should. Or could. The light winked out. Emrakul was gone. They had won. The silver face of the moon glowered with the triangular patterns of the glyph. Branded. Scarred. Sealed. For a moment, the only sound was the stirring of dry leaves in the wind. Next to him, Tamiyo dropped to her knees and vomited. She felt exultant. She had known delight many times before. The day she had regained her youth. When she killed the demon lords Kothophed and Griselbrand, hearing their death screams. Each of those moments had felt like cheating; the best kind of cheating, where you get away with it and still win at the end. But this moment was even sweeter. Perhaps it was because she had truly known she was going to die. Perhaps it was because she had so rashly taken on Emrakul in her pride and thirst for control, and yet none of them would be alive had she not done so. Perhaps it was because there was no more Emrakul. Its taint, its taste, was gone from Innistrad, and everything was better in its absence. Just thinking of Emrakul made her shiver. She had been so close to death. Or worse. She stared at the moon. May you rot there forever. Know the consequence of opposing Liliana Vess. The assorted Planeswalkers had gathered at the close of a very long day. After the battle with Emrakul was won, there were still fires to put out, eyes to close, grief to console, wounds to heal...or not, in the case of much of the trauma. Liliana didn't much care. Every time she pushed the limits of the Chain Veil she felt empty afterward, as if a part of her was missing. It had happened so many times now she was not even sure she could identify what was absent anymore. Besides, it didn't matter. She had had her fill of good deeds for quite some time. None of you would be alive if not for me. You're lucky I don't demand payment for my rescue of this world. Well, she would demand payment, but not now and not from anyone on Innistrad. It was remarkable what imaginary obligations and loyalty made people do. Take the Gatewatch. They owed each other nothing. Literally nothing. And yet here they stood, fighting for each other, willing to die for each other. Liliana was used to the effect of such relationships; she depended on them, as long as they were with her zombies. That was a reliable power dynamic. But Innistrad had shown the limitations of her approach. Zombies were great servants, but there were certain tasks they couldn't accomplish. And fighting alone was wonderful...until it wasn't. When you weren't prepared for the unlikely, and there was no one to save you from the untimely. Once upon a time recently she had thought to leverage the emotions Jace had for her. Or had had, if she must admit. He is just a boy. A boy, and I should know better. Jace had proven reliably unreliable, his recent success notwithstanding. What were you doing with your spell while I kept you alive? Trying to think Emrakul to death? While she acknowledged whatever he had done had worked, it did not dramatically improve her opinion of him. A boy. I should be done with you. But here was an opportunity far beyond Jace and his limitations. Here was a group. A group of friends. Today was a revelation, a revelation of the power of friends. Manipulated correctly, friends were like better zombies. Helping you and saving your life because they wanted to, not because they had to. What more could she do, with powerful friends like these? What more could she conquer, what more could she obtain? She smiled at the thought of it. They would not obey her direct orders, but did it matter? Jace wasn't the only child compared to her. They were all children. None of them had her centuries of experience, none of them had tasted the power she had, either before or now, none of them were as ruthless or focused as she was. She didn't know where the Raven Man was. There was no sign of him inside her head or out. The Chain Veil was subdued. Today had been an extremely painful lesson in how unreliable a weapon it was. But when I have my own Gatewatch to heal me after every use...a thought for later. But she liked the sound of that. My very own Gatewatch. Gideon had been rambling on and on to Tamiyo. The moonfolk looked sick, and Liliana could hardly blame her. Gideon was nice enough to look at, but she had known zombies who were smarter. Gideon was babbling something about the Gatewatch, and how they were just starting up their do-gooding, and wouldn't Tamiyo like to be a do-gooder too? Tamiyo shook her head, excusing herself, her eyes wide and frightened. It figured that a mind mage would be too fragile. Like Jace, useless. Jace was looking at her, that puppy-dog look in his eye still. At least make up your mind, child! She bit down on her irritation. She needed him and his puppy ways here. "Gideon." Jace's voice was tentative, slight. They talked quietly amongst themselves, and Liliana made sure to show no hint of the smile she felt. Yes, cloak boy, bumble your hesitant way toward your sincere desire to help me. It was clear Gideon was not happy about it, though. Though Liliana was not sure Gideon was ever happy about anything. You should at least delight in your youth and attractiveness while you still have it. Why are children so dumb? Eventually the eye-candy approached. There were more do-gooder words about do-gooding, but Liliana was too focused on the oath to pay close attention. She had thought extensively about the right approach to the oath. Too sincere, too sugary, and suspicions would be raised—suspicions that would make her next steps harder. But too cynical, too revealing, and those suspicions would instead be confirmed. She needed a delicate touch, a hint of cynicism but with her heart clearly in the right place. When Gideon asked her for her oath, she was ready. "I see that together we're more powerful than we are alone. If that means I can do what needs to be done without relying on the Chain Veil, then I'll keep watch. Happy now?" She said it with a touch of a smile, but just a touch. Besides, her pleasure was genuine. The best lies always contained enough truth to slide through. She was now a member of the Gatewatch. Futures unfolded in her mind, full of promise and ambition. Jace was exhausted. It had been the longest day of his life, and all he wanted was to sleep; a sleep free of dreams or any thinking whatsoever. But there was someone he had to talk to first. He found her in the far outskirts of Thraben, sitting in the ruins of a small church. There were few buildings in Thraben left standing, and this church had not been spared. She just sat there, her legs crossed over one another, her eyes closed. Jace felt weird interrupting such a private moment. But he had to know. "Tamiyo...? Are you...can I...?" Jace didn't know how to ask his question. Tamiyo opened her eyes, her face still full of the sickness and dread she had displayed ever since they finished casting the spell. "What happened out there, Tamiyo? You were there, mind-linked with me, and then you...weren't. You vanished. What happened to you?" Tamiyo sat there and began crying. Tears dropped from her eyes, one after another. Plip-plip, as they hit on the stone rubble beneath. Her words came out staggered, halting. "Nissa had fallen. The spell was in danger of collapsing. I didn't know what to do, how to help." Jace was surprised. "So Nissa generated that power by herself? Impressive. I had thought it was you, with the second scroll." Tamiyo looked at him, sadness and scorn both in her eyes. "No. You don't understand. It was me. With the second scroll. That's where the energy came from." "But that's wonderful! You saved us! You saved all of Innistrad, all of...everything! Is it because it was one of the iron scrolls? One of the scrolls you didn't want to open?" "Just shut up, Jace! Listen, just listen. It wasn't me. It...she...took me over. Do you understand? It was not me! I was there, in my own body, helpless as she came in and took over. My eyes, my hands, my voice...she took them all over. They were not mine." Her cries became full sobs. A voice came back to him, her voice as he had watched his chess pieces stab and kill each other. They are all my pieces, Jace Beleren. They always were. I just no longer want to play. "I...I am sorry, Tamiyo. I don't know..."
"But that wasn't the worst part. The scroll I opened. The second one. You were right. I shouldn't have opened it. A promise made long ago, which one day I'll have to answer for. But the spell she read...it wasn't the original spell. The scroll she used, it cast...a different spell." Emeria. From somewhere a long stylus appeared, and she began writing in the scroll. Jace began shaking. "It was changed. How did she do that? How could she do that?" Tamiyo's voice was near panic. "As this monster took over my body and read a scroll, a scroll that should have brought devastation to everything on this plane...instead it fueled a spell that trapped herself here. How did that happen, Jace? Why did it happen? What did we just do?" "I...I don't know." Jace had no more words for her. None for himself. Tamiyo took a deep breath. "I told you before, Jace. Sometimes our stories have to end. Yet here we are, each seeking to prolong our story, no matter the cost. But what if all stories are just her story, all in service of some awful destiny waiting to unfold?" Tamiyo looked up at the moon. "Did we really win?" Tamiyo's voice was no longer fearful, but plaintive. Jace had no answer. Eventually she rose and flew into the dark sky. There were no parting words. Jace sat for a longer time still. He looked again at the moon in its silver luminescence, the glyph still brightly inscribed on its surface, a testament to what the Gatewatch had achieved. In that moon's depths was the most powerful and destructive force any of them had ever encountered. The angel's words stabbed in his head, daggers from a destiny unrealized. This is all wrong. I am incomplete, unfulfilled, inchoate. There should be blossoms, not barren resentment. The soil was not receptive. It is not my time. Not yet. His spine was cold. It is not my time. Not yet. He dropped his gaze from the moon, and went in search of a safe bed to find temporary oblivion.